CACEI is a Civil association that maintains the current recognition, as an accrediting organization of undergraduate engineering academic programs, granted by the Council for the Accreditation of the Higher Education, A.C., (Copaes). Copaes is the body recognized by the educational authorities of the country as the qualified and empowered instance to confer formal recognition in favor of organizations whose purpose is to accredit academic programs of public and private Higher Education Institutions. 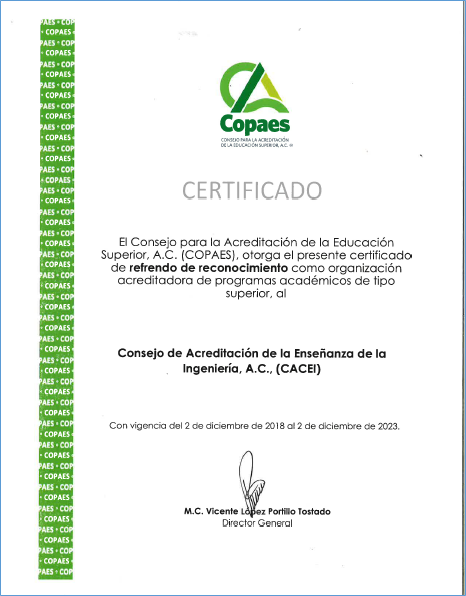 The process of accreditation of the educational programs of CACEI adheres to the academic standards emitted by Copaes, and takes into account the adequacy of the set of factors that intervene, specifically the faculty, the equipment, the curriculum, the Infrastructure, institutional learning support services, methods and instruments for evaluation and community patterns of academic interaction.